The Murder at Midnight is a exceptional, thrilling, and suspenseful book that leaves the reader with a cliffhanger at every chapter. 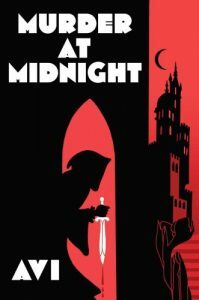 The Murder at Midnight is about a young boy [Fabrizio] who used to live on the streets, but was hired as a servant for a magician, when the magician’s wife stumbled upon him sitting on the streets. Fabrizio’s job leaves him with many mysteries every night, Fabrizio finds himself snooping through his master’s stuff to try and find how he does his tricks, but comes across something else, a murder. This was definitely one of my favorite books and I wish there were more, or if there was a series. I would recommend this book to people who like mysteries and suspense, also to people who are in 6th and 7th grade because there a complexity to the book but not enough to make 8th grade level, but there a easy part to the book but not enough to make it a 5th grade level. But there are also some substandard part about the book. In this book it’s based 1700’s, so everyone is talking in old accents and you start to gain confusion. But that really means nothing compared to how good of a read this book really was. The theme of this book is suspense. There are a ton of examples of suspense in this book, one is when fabrizio is arrested for questioning the prince and is sentenced to execution, he is released, and his enthusiasm is priceless, he yells “ Signore… it says … it says … ‘let the boy … go … free!” I loved this part because the whole time when fabrizio was reading the letter he was thinking it was going to say to “kill him at once!”, and the executioner was definitely not to thrilled to kill a child so his enthusiasm was also funny. At first when fabrizio was reading it the executioner said “prepare yourself for death boy.” but as fabrizio kept reading and got to the part where it said let him go the executioner yelled, “Does it? Perfectly amazing! In all my years that’s never happened before.” which let a huge relief of stress when i though the main character was about to die.